In Seattle and across the nation, raising the minimum wage has become the defining political issue of 2014. Sen. Patty Murray was on our Capitol Hill Tuesday to reiterate her support for a Senate bill to increase the federal minimum wage, while Mayor Ed Murray laid out his vision for a higher minimum wage in Seattle during his inaugural State of the City address across town at City Hall. 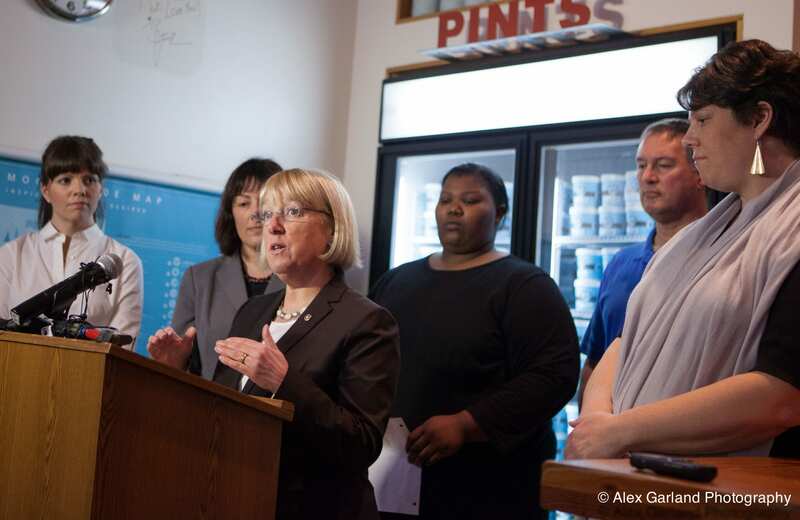 Sen. Murray joined Rep. Suzan DelBene, small business owners, and workers at Molly Moon’s Homemade Ice Cream Shop on Tuesday to voice support for a Senate bill that would raise the federal minimum wage from $7.25 to $10.10 an hour, a proposal also backed by President Barack Obama. 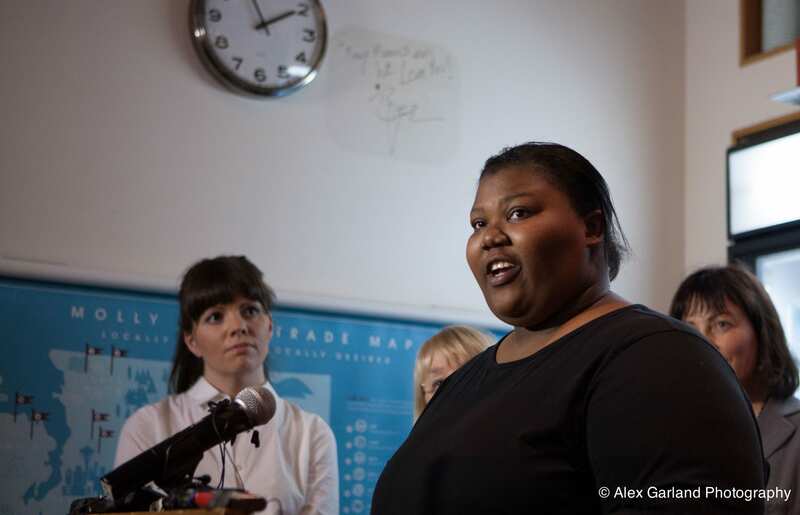 One of those people is Martina Phelps, a 22-year-old Seattle Central Community College graduate and full-time employee at the First Hill McDonald’s, one of the restaurants to be targeted for a fast-food boycott this Thursday. Phelps spoke alongside Murray at the event. “Because I make low wages I can’t go back to school and I can’t afford a car, which results in a four hour trip back and forth on the bus for work,” said Phelps, who lives in Skyway. Molly Moon Neitzel, who opened her namesake ice cream shop in 2008, said her 50-80 workers already make a net $15 an hour wage, but that raising the federal minimum wage would be a boon for her business. “When people in my community have a few more dollars in their pocket per hour, per day, per week, they’re going to think maybe they can take their kids for an ice cream cone after dinner,” she said. In 2010 Sen. Murray was at Capitol Hill’s Cupcake Royal alongside Moon to announce the launch of The Main Street Alliance of Washington, which as been active in organizing small business owners around the minimum wage issue. Sen. Murray said Seattle’s push for a $15 an hour minimum wage would not interfere with her efforts at the national level. 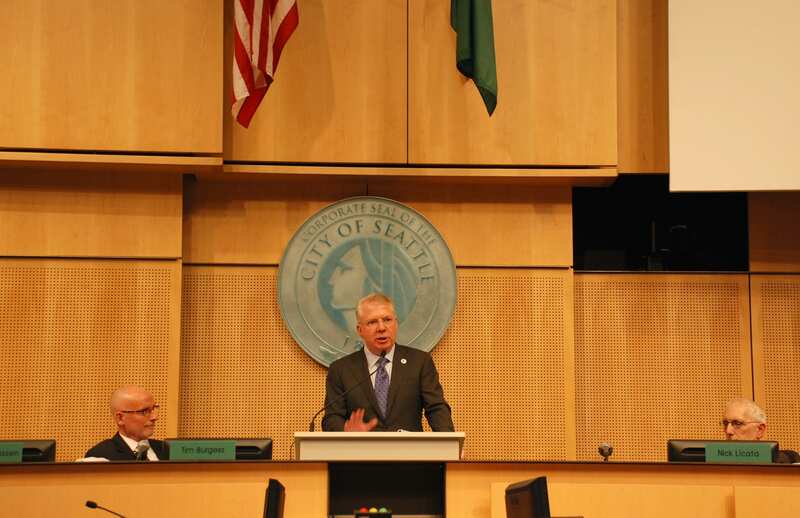 Mayor Murray touched on that proposal during his inaugural State of the City address that got going not long after the ice cream shop stumping was winding down. “We can increase the income and purchasing power of low-wage workers while protecting small businesses, retaining jobs, and fostering economic development throughout the region,” Murray said, speaking before the City Council and a full council chamber. During the speech Murray also vowed to launch a bike share program this year and push through funding for a Center City/First Avenue streetcar line that would connect to the First Hill Streetcar on Capitol Hill. Offering affordable pre-school for all is also the mayor’s agenda for this year, as is a conducting an sweeping assessment of the city’s assets and how they impact climate change . Murray called the rising cost of housing as a percentage of income a “crisis” in Seattle, and said affordable housing is among the root causes. “I plan to work with Council to duplicate the approach we have taken with the living wage issue and apply it to the issue of affordable housing,” he said. Murray’s polished remarks were drastically different from predecessor Mike McGinn’s first speech, which was unscripted and appeared off-the-cuff. Following the speech, Council member Tim Burgess presented the mayor with a picture showing a young Murray during his days as a Seattle City Council staff member. Burgess thanked the mayor for promising to “follow the leadership” of the City Council. Video of the speech is here, or you can read it below. The Molly Moon’s event and Murray’s State of the City comes amid a flurry of wage focused events around the city. On President’s Day, the Capitol Hill Chamber of Commerce gathered members in a closed-door meeting to discuss the best path to raising the minimum wage and how to best protect small, local businesses in the process. CHCC executive director Michael Wells said small business owners were supportive overall of raising the minimum wage, but rightfully anxious about sustaining their businesses. “We’re not here to create scare tactics, but we want people to understand the realities of running a small business,” Wells said. CHS attended the meeting as a member and agreed to treat all conversation as confidential. However, we plan to cover many of the issues and ideas raised at the meeting in coming weeks. Recent polling showed that 71% of Capitol Hill-area voters support a $15/hour minimum. The mayor is expected to announce a minimum wage plan sometime in April. City Council member Kshama Sawant, who spearheaded the $15 an hour movement, has said she would support a ballot measure should the mayor not come through with a comprehensive plan. This entry was posted in News, etc. and tagged city hall, minimum wage, pike pine by Bryan Cohen. Bookmark the permalink. According to the Congressional Budget Office (nonpartisan agency) report released yesterday, raising the federal minimum wage to $10.10 would mean a loss of approximately 500,000 jobs, and only 19% of the overall increased earnings would go to families below the poverty line. This same effect would also be true if we go to $15/hr locally, or even more so since the increase is far greater. These figures should give us, and the politicians who are jumping on the bandwagon, pause. Minumum wage increases should be done very carefully and incrementally. The report is available at cbo.gov/publication/44995. I wish someone would address if this raise applies to employees who are paid less than $15 an hour, but make more than that when you include tips. Beers are going to cost a lot more if I have to increase payroll by 50%. I’m skeptical. Beer prices went up 20% or so a few years ago when a warehouse in eastern Washington burned. Hop supplies returned to normal with the next harvest, but retail beer prices came back down. If you ask people if minimum wage should be raised, a lot of people will say “of course.” The flip side is by raising income in a blunt way like this, it’s naive to think costs won’t increase at a similar rate, not just for what the businesses provide, but for staples like rent. If you ask the same people you ask about minimum wage whether they’re willing to pay 30-40% more for many of their goods or their rent because there’s a rapid increase in money in the system, they will think twice. And those working poor will end up with higher costs that will offset their income gains. While everyone supports higher wages, the fundamental issue that these types of measures fail to address is that there are too many people being forced to work low-paying jobs. We lost an entire class of mid-range jobs in the last 20 years or so, moistly in manufacturing. Mandating that McDonald’s pays its worker $15/hour is fine and dandy, but where are more of the solutions for putting those overqualified employees to work elsewhere? I have spoken with a number of small business owners who’s businesses will likely be forced to close because of this. At a minimum many business will just close because the return on their investment will be so small that it won’t be worth all of the enormous risk they take in guaranteeing bank loans, liability insurance and all of the other risks and costs associated with running a business. Most of these business owners are scared to death to speak out because they are afraid of being vilified by some A-Hole who goes to the King County Parcel Viewer to figure out where they live and reports to the whole world how much their house is worth according to King County. Because of course it’s awful anyone who takes risk and has worked their asses off, and used their talents their entire life would get to live in a nicer house. Tempest in a teapot. There may be some growing pains in the short term. In the long term it will help everyone, including small businesses. More money = more buying power = more demand for goods and services = more small businesses providing those goods and services. “There may be some growing pains in the short term” = An immediate jump in minimum wage would force me to close my business and lay off 8 employees, as a small business owner, I’m not willing to be part of your so called ‘growing pains’ statistic. I don’t think it’s that simple. The increased incomes will mainly be used for necessities, such as food and rent, so it’s likely that only certain businesses will benefit, and most of those will be large chain stores and landlords. I agree, as a small business owner, I’d be forced to close unless I decide to raise my prices drastically. Starbucks and McDonalds might be able to absorb that but small coffee shops like mine won’t. Some people might earn more, but would they be willing to spend 8-9$ for a latte? Cuz that’s what I’d have to sell it for to survive. Highly doubt it. And while the budget office predicts a loss of 500,000 jobs, is that net? Or is that current jobs? What are the effects of increases in jobs due to increased demand or buying power from the consumers? An increase in buying power assumes that increasing income for some percentage of people doesn’t result in inflation. Unless you’re going to tightly control pricing, a lot of things will increase in price, not because they necessarily have to in order to offset higher employee costs, but because they can.